Phones do a lot of things these days, but we bet you haven't thought of this application - fighting counterfeit money with your trusted handset. Giesecke & Devrient (G&D) is the company in charge of producing a number of the world's currencies, and is always trying to be at the forefront of security banknote features. MAGnite is the latest invention, and is basically a thin and durable microcapsule that contains enclosed and protected dyes which react to magnetic force. The ink arranges in a certain pattern, depending on the magnet it is aligned with, allowing to visually certify that the banknote you are holding is legit. What G&D has thought about is that most of us are carrying cell phones these days, and the speakers in these handsets have simple magnets in them. Thus the MAGnite counterfeit operation works with any cell phone, too, just that the pattern of the ink is oval instead of the streak one that store anti-theft gear would produce. G&D are hoping that such a system can be put in place instead of complex watermarks or archaic security threads. This way you can quickly place the Benjamins just received in Starbucks for that Craigslist iPad over your phone's speaker, and if the thing morphs into an oval shape, get the buyer a coffee. 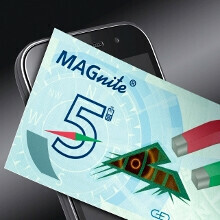 Munich, December 11, 2012 – MAGnite is the latest interactive Giesecke & Devrient (G&D) security feature for banknotes. This feature is based on the interaction between special color pigments and simple magnets, such as those found in the speakers of mobile phones. These color pigments align along the magnetic field lines when the banknote is placed over a magnet and make the feature visible. A high-contrast change of the image appears on the banknote, allowing users to verify its authenticity instantly. The image can be generated by any magnet that is readily available, such as those used in handbag clasps, or those employed in electronic theft-prevention systems at store checkout counters. MAGnite is based on functional pigments in specific inks. In order to ensure that an instantaneous switch between two color effects takes place reliably at any time, the pigments are enclosed and protected in highly durable microcapsules, which were developed by G&D. The pigments in the capsule must have full freedom of movement so that they can be aligned in any desired direction when external magnetic forces act upon them to reveal their color in a certain pattern. Different types of magnets produce different patterns or images. For instance, when a mobile phone is used, a rounded oval effect can be observed. By contrast, a streak effect is created when the banknote is verified using the magnets integrated in the electronic theft-protection systems found in retail stores. "The MAGnite feature is quick and easy to use, and the optical effects are easily recognized," says Bernd Kümmerle, Head of the Banknote Printing Division at G&D. "The new security feature is so dynamic and practical that it offers the general public a sound alternative to watermarks and security threads." Clear and easily verifiable security features are important to safeguarding public trust in a currency. The more complex the technology behind these features becomes, the more difficult it becomes for potential counterfeiters to reproduce these features. G&D aims to be at least one step ahead of counterfeiters at all times, even in the digital age, which is why the company develops a new security feature each year. Security features for banknotes fall into two categories. In addition to elements that the general public can easily verify, there is another group of security features that allow retailers, banks, and cash-in-transit companies to assess the authenticity of banknotes. The hidden features of the highest level of security are the exclusive domain of central banks and can be checked with special technology only. I use the LED flash (as a flash light) to check the authenticity of the new Canadian bills.